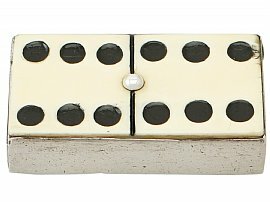 This fine antique Victorian sterling silver vesta box has been realistically modelled in the form of a doublet six domino piece. 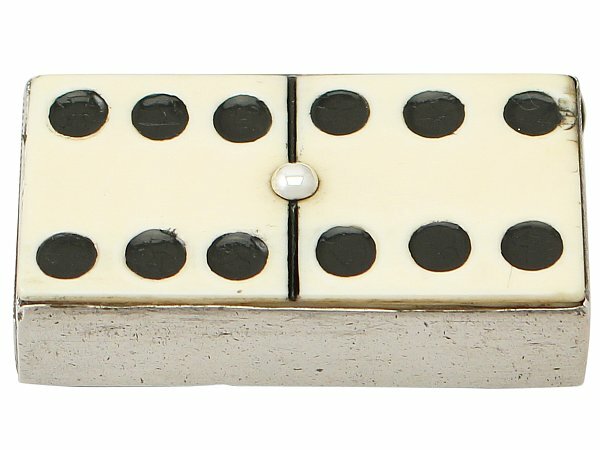 The body of this sterling silver vesta box is ornamented with an inset ivory panel accented with two formations of six subtly concave painted spots (also known as dots or pips) to either end. The posterior surface of this impressive Victorian vesta case is plain and unembellished. The novelty case is fitted with a plain swivel compartment securing to the lower portion of the body. The lower edge of the hallmarked internal compartment has a serrated panel/match striker. This antique Victorian silver vesta box is a very good gauge of silver, excellent quality and excellent condition. There are some surface blemishes to be expected with such a piece of this age. Full hallmarks struck to the posterior surface of the case and part hallmarks to the interior compartment are all very clear.